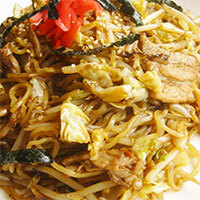 Yakisoba is a Japanese dish, one of the best known street foods. It’s made from ramen like noodles, bite sized pork and vegetables (cabbage, onions, corn, green peas or carrots). It can be seasoned with sweet and thick sauces such as Oyster sauce or simply yakisoba sauce, salt and pepper. Although not diet food per se because it is high in fat, calories and sodium, Yakisoba can be adjusted to fit the needs of one’s diet, or even personal preferences. It can be served with less pork and more vegetables, or the pork can be replaced by chicken meat, or no meat at all for vegetarians. The calories in Yakisoba per 280.9g(1 plate) is 469 calories. Yakisoba is calculated to be 167Cal per 100 grams making 80Cal equivalent to 47.9g with 67.95g of mostly carbohydrates、15.28g of protein、13.48g of fat in 280.9g while being rich in vitamins and minerals such as Vitamin K and Sodium.